At the top of the Invoices page you can see the Search bar that you can use to find invoices by a particular keyword or detail. Note By default the invoice list is filtered to show new invoices created within the last 90 days. To find invoices by a keyword, enter the appropriate keyword in the Search box, and then press the Enter key or click the Search icon. 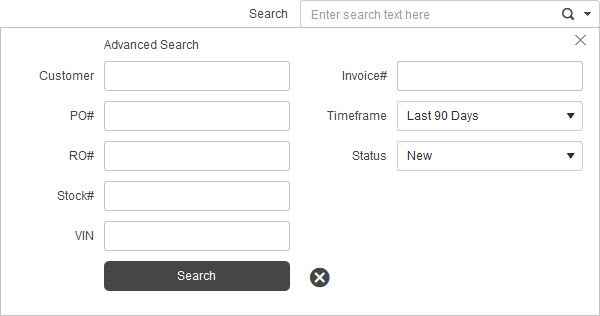 To filter invoices by their details, click the down-pointing arrow, enter search settings, and then click Search. VIN lets find invoices if your search term includes last symbols (at least one last symbol) of the VIN. The same is true for the free text search in the Search box. Timeframe allows selecting a predefined period, for example, last week, month to date, etc. or set a custom period in the From and the To boxes.